In the Backlog and Team Backlog modules, use different ALM Octane widgets to analyze release progress. 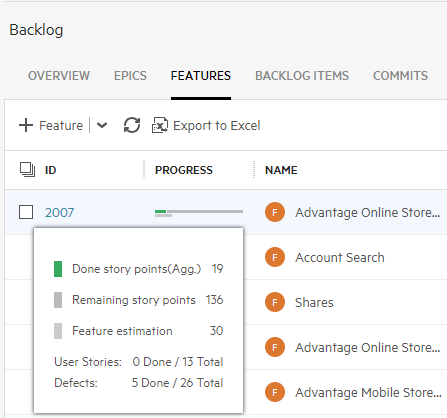 Note that ALM Octane measures progress for Epics and Features by story points, and progress for Backlog Items in hours. View the Progress column in both the Grid View and Smart List View. In the Backlog, use the release filter to update each of the widgets for a current release and sprint. Add the Release Forecast widget to the Dashboard module. 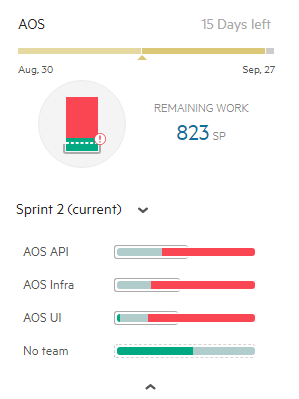 This widget displays a line with the forecasted progress of user stories or defects through the end of selected release. This graph also includes details on the release, including finished story points and expected completion. ALM Octane displays the forecast line after you mark enough Backlog items as Done. The forecast is based on the state of the release’s actual story points until now, together with the planned story points for the team. This is based on the team manager’s expected velocity, as defined in the Team Backlog module. The gap between actual and planned velocity is used to forecast when the release content will be complete, based on the assumption that this gap will remain constant in the future. For example, if the expectation to date is 50 points and actual completion is 45, the gap shows that the current pace is 90%. The forecast assumes that at the planned date of completion, 90% of the content will be done. If there is no expected velocity available for calculation, the forecast is based on the assumption that the actual points-per-day rate will remain constant in the future. 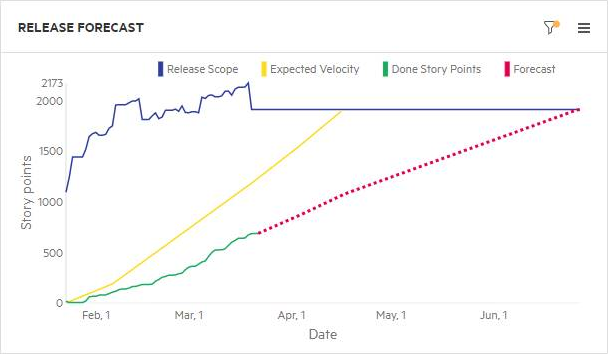 The solid green line shows actual progress, and the yellow line shows expected velocity as defined by the team leader or equivalent role. If the forecast (dotted) line is green, this means the release content is expected to be done by the release date. If the line is red, the content will not be complete on time, at the current rate of progress. Where can I see forecasting? Forecasting is available on Agile graphs, and not on Custom graphs. Forecasting is available for a release, and not for a sprint. You can see forecast data on burn-up graphs only. If there are too few story points to generate a release forecast, your graph will be empty. Clear the Forecast checkbox to show data in the graph.